In a world objects are labeled, their functionality designated, Subverted Boundaries attempts to displace the “standard” outlook in more ways than one. Held in Sculpture Square, an art gallery, the spaces go beyond the usual function of showcasing and displaying art works for people to enjoy and admire. They mould the artwork, bringing inspiration to the artist. Creating spaces that go beyond just displaying, but also creating. Bringing together the works of nine regional artists from Thailand, Vietnam and Singapore, Subverted Boundaries attempts to juxtapose these diverse cultural backgrounds, and weave them into a seamless expression. Despite the supposed rift between cultures, the exhibition crosses the physical boundaries, overcoming the language barrier to bring people together regardless of cultural background into an intellectually and visual discourse through art that can be related to. 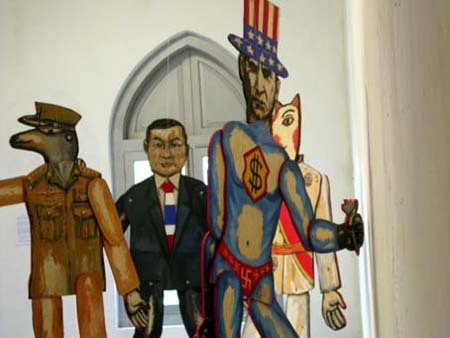 Vasan Sitthiket’s (Thailand) politically charged “Thai Luminaries” presents issues in an iconic manner through the medium of giant wooden puppets. Critical of Thai politics and world issues like war. These puppets bring to mind the great performance of life that we are all a part of. Visual communication and imagery bring new interpretations to the original intention. Stories unfold before different peoples’ eyes. 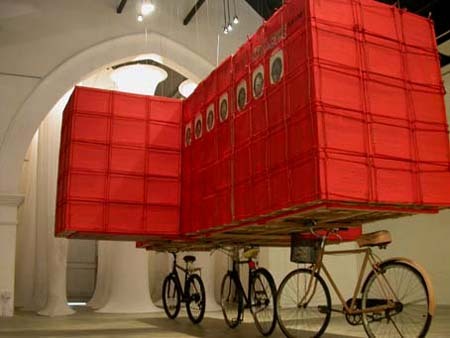 Nguyen Minh Thanh’s (Vietnam) Cross-Bike-Airplane makes reference to the site it is displayed in. A giant plane in the shape of a cross in a plan view makes a strong connection to the past of Sculpture Square. Sculpture Square has a hundred and thirty three history which includes being a Methodist Chapel. Sited in the center of what use to be a Christian worship hall, the cross makes a strong symbol to the past. 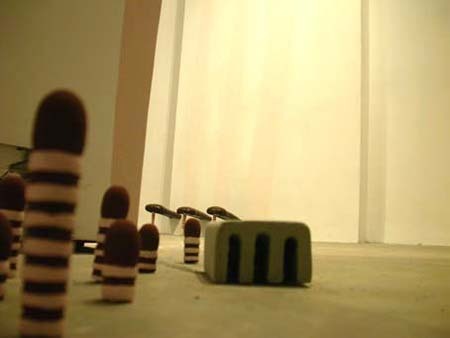 Even more so when this installation further fuses history and present through the symbolic use of subject matter. Traditional bicycles support the plane, a symbolic reflection upon how the past feeds the present and the future. Combining traditional Vietnamese painting in a post-modern installation further develops this concept. Lim Shing Ee (Singapore) brings across a phenomenon in Singapore. In a society that is so caught up with the pace of the world, Singaporeans often overlook the little things in life, detaching themselves from emotions and memories. Yet ever so often, a scent, a scene or even a song would provoke the recollection of the past. Shing Ee presents her mind mapping in a stylistic manner. Her installation lean maTTer presents an array of furniture-like objects that represent the relationship between people and objects in everyday life. The spatial quality allows people to immense themselves in her world, framing an instance, a form of relief from the rush of everyday life. Cultural Boundaries are crossed. Boundaries are erased and removed as thoughts, expression, understanding, texture, feelings and atmospheres are felt, understood and created in the face of cultural identity. Perhaps we are not so different after all. Then why the need to set boundaries?